Losing is part of the game. If you never lose, you are never truly tested, and never forced to grow. A loss is an opportunity to learn. But losing can be upsetting, and can cause emotions to take the place of logical thinking. Below are some common “losing attitudes.” If you find yourself saying these things, consider it a red flag. This is the most entertaining complaint of the bunch. When this player loses to someone he considers a weaker player, the “I lost to a scrub!” line is sometimes used as an excuse. This player is saying that he is very good at the game, and losing to such a poor player doesn’t prove anything. He often enumerates all the weaknesses of this “poor player,” including such gems as “he relies on only one tactic” and “his mind games are weak.” The more he puts down the other player, though, the worse he looks himself. If the other player relies on only one tactic, and you can’t beat it, then what does that say about you? This need to displace the blame is probably motivated by pride, but it deprives you of a chance to learn from your mistakes (and it alienates other players, a point which you may or may not care about). Basically, you need to have some respect for other players who have the power to win, no matter what faults you may see with their play styles. Sometimes, these “weaker players” really are better than you, and you just aren’t admitting it. And if they aren’t better, then you should not let them win. You should be recognizing and learning from your own mistakes, or you should be improving to catch up to them. Either way, the heart of the issue lies in you, not in the player you just lost to. This is the opposite of the above statement: underconfidence rather than overconfidence. Sometimes this line is said in sadness after a loss, which is somewhat understandable. In that case, just stick in there and keep trying. The real crime, though, is when this is said before or even during the match. A low self-esteem can be debilitating. Some players get thrown off by a past loss or other bad event in real life. They then take a losing attitude into the game, even in cases where they objectively have an advantage in the match (such as a better deck in Magic: The Gathering or a favorable character matchup in a fighting game). This type of player needs to put all that out of his mind and focus on the immediate match. If you do have some advantage going into the game in your choice of character/side/deck, general play skills, or specific knowledge, then that’s what you should be focusing on. And if you don’t have any of that, that’s all the more reason to work harder, be smarter, triumph against the odds, and show the naysayers how wrong they all are. Self-doubt does not win games; positivity does. In all fairness, sometimes the game is dumb or too random or too boring. In that case, you should stop playing it altogether and find something better to do with your time. But these claims are often made against perfectly good games. For the “dumb” game, there might be another level of understanding above your own that makes the game brilliant. The same could be said of poker. Even though randomness plays a large part in an individual hand, the same top players emerge with the most money over the course of several tournaments. The “too boring” comment is always an easy way out. Basically, all these complaints are about shifting the blame over losing away from yourself and toward supposed deficiencies in the game itself. Again, sometimes the game deserves to be criticized, but be aware that these complaints are often just excuses that allow you to shrug off a loss rather than actually learn from it. Catch yourself if you start to fall into any of these losing attitudes and take responsibility for your losses. Only the loser plays the part of the victim. 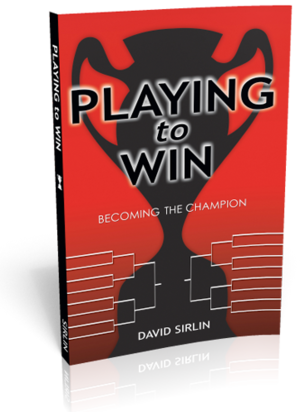 The winner takes charge and actively seeks out improvement.